I love love love mac and cheese. It's one of my favorite foods but unfortunately, my hips don't feel the same way! I do indulge every once in a while but it's a rarity. 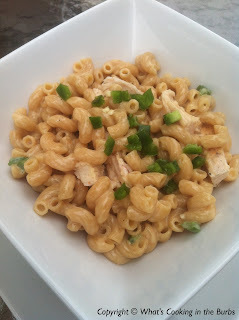 I've been craving mac and cheese like crazy lately so I decided to create my own lower cal/fat version. Toss in some spicy chicken for protein and you've got a delicious dinner! Boil pasta according to package directions. Drain and set aside. While Pasta is cooking, in a large saucepan over medium-high heat, melt cream cheese and milk. Whisk until smooth. Add in Cajun seasoning and shredded cheese. Once cheese is melted add in the jalapeno and cooked chicken. Stir and toss in the cooked macaroni. Serve immediately. Top with additional chopped jalapeno if desired. Enjoy! My husband would love this. He's a huge Cajun seasoning fan! Thank you for linking up to Simple Supper Tuesday. What a nice twist to mac & cheese! I love a little spice in my food. Hey, why don't you stop by and add this link to Wonderful Wednesday Blog Hop? It just went live....would love to have you join us. I'm 16, this seems easy to make. But what do I do with the chicken? I apparently left that step out! You add the chicken in with the jalapeno once the cheese mixture is melted. As far as your cooking method for the chicken...I grilled mine and then chopped it. But you can prepare it however you would like.